Hi everyone! I’m back today with another book review for you all, so I hope you enjoy it! 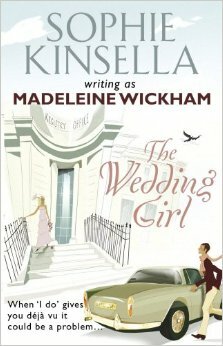 For those of you who don’t know; Madeleine Wickham is the real name of the well-known author Sophie Kinsella. However, although the novels written by both names are similar in genre, they are written in different ways or styles so, for all intents and purposes, it is like they are two different authors. I have read many Sophie Kinsella novels as she is one of my all-time favourite authors; however, this was my first Madeleine Wickham novel. Before we dive into the review I’d also like to add that, for this post I have used an image from the internet rather than photographs of my own edition as this was another charity shop find and therefore it is not in the best of condition. And now; on with the show! The Wedding Girl follows the story of Milly, a girl who once married a man in order to keep him in the country when she was young and free, and who is now about to marry the man of her dreams, Simon, in what her mother hopes will be the wedding of the year. Nobody in Milly’s family knows about her first marriage, but will her past comes back to haunt her a few days before her wedding. The plot of this novel pleasantly surprised me, with there being more well thought out storylines than I expected. Although Milly’s past and her wedding were the main focus of the plot there were quite a few sub-plots that were very interesting and all of them were well rounded and perfectly padded out, instead of lacking in entertainment value or great characters as is sometimes the case in romance novels. One of the sub-plots that I enjoyed was the story of Milly’s sister Isobel, a successful interpreter and translator of many languages, with a secret. It was fun to see Isobel’s side of things and, of course, find out her secret. I must say that there were times in the story that I felt it was lacking a little in excitement, however, this was forgiven by the fact that there were a few plot twists in this novel that took me completely by surprise. I loved the element of mystery that was present in the plot, this for me was one of the key differences between the writing of Madeleine Wickham and Sophie Kinsella. The main character, Milly, was not one of my favourites in fact I definitely preferred her sister Isobel. Milly was a little naïve for her age, particularly with regards to her relationship with her fiancé Simon and I found this irritating. However, throughout the novel Milly seemed to grow a backbone and started to stick up for herself which helped me to start rooting for her, her character development was great. The family element in this novel was very prominent and I thoroughly enjoyed this as sometimes in adult novels it can seem to escape the mind of the author that adults still have parents, sibling etc. The characters of Milly’s mother and father were funny and emotional in equal measure which made them very realistic to read about. I can’t forget to mention Rupert, who is a key character in the novel but I will not reveal for what reason. Rupert is a man living a lie and struggling with sexuality. I found this character and their story to be extremely emotional (yes, there were tears) and poignant, not to mention extremely well written. I really appreciated that this sensitive and more serious theme was included in the novel in a big way as it really added another level to the story, veering it away from being a typical romance novel. This theme also made me happy as I realised how far the world has come in celebrating and accepting LGBTQ+ people in the past decade. Overall I thoroughly enjoyed this more ‘grown-up’ or serious writing style that still managed to keep Wickham/Kinsella’s trademark humour. It wasn’t as fun as the shopaholic series but then it wasn’t supposed to be, therefore I will definitely be exploring more of Wickham and Kinsella’s works and championing their differences! Let me know if you have any thoughts in the comments!